To apply for a FREE subscription to Tire Review magazine, please respond to the questions on the form below. All fields marked with an asterisk (*) are required. If you are outside of the United States and/or have questions about your subscription, please contact customer service at (330) 670-1234 x242. Tire Review is committed to helping today’s independent tire dealers run and grow a stronger, more competitive business. We celebrate the success of the independent tire dealer, with information, advice and how-to information to run a better business, selling more tires and service to more people more often. Headquarter Office of Mass Merchandiser including: discount store chain, automotive chain store, mail order firm, internet firm, department store chain or oil company. In the next 6-12 months, do you plan to purchase a tire changer or wheel balancer? 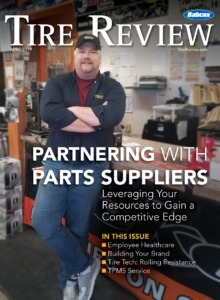 Would you like to receive the Tire Review eNewsletter, Tire Review World Report Daily?